The Admin Dashboard is the place that you, as a Venue Manager will spend much of your time managing users, bookings, plans and invoices. We've tried to make navigating this dashboard as simple and clear as possible so you can get work done fast. 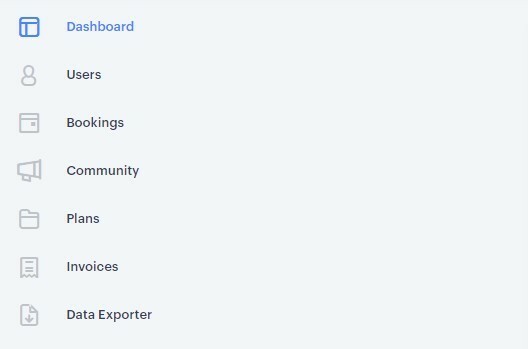 Dashboard - This is the main landing spot when you log into your dashboard. From here you can create, cancel and manage current and upcoming bookings. Users - The user panel allows you to add and remove members and teams. Bookings - The bookings panel provides a more in-depth view of past, present and future bookings. Community - Within the community panel you can send messages to your entire venue. Plans - Create, remove and manage new and existing plans for your members to subscribe to. Invoices - View your invoices, past, present and upcoming for individual members and teams. Data Exporter - A free optional add on that provides advanced exports of certain data. Venue & Spaces - You'll need to go here to create a venue and add spaces (boardrooms, hot desks) to it, as well as complete crucial information such as address and operating hours. Apps - This area lets you install integrations such as Stripe, Google Calendar and Data Exporter to name a few, as well as explore our Zapier integrations. 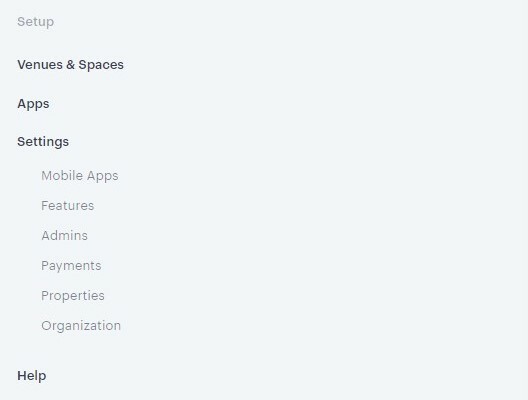 Settings - The settings menu is packed full of important things to check out, such as creating or removing venue admins, setting up payments and uploading your organization's logo. You can access your admin account settings as well as your billing details for your Optix subscription via the avatar at the top right of the admin dashboard. Account - Edit your name, email address, password and avatar. As well as your short bio and skills. Optix Billing - Add a payment method, see upcoming invoices and edit your organization details. Try visiting our Getting Started Video Series to learn about key capabilities of Optix or check out our Getting Started Checklist to learn what needs to be configured to get your account ready for users!